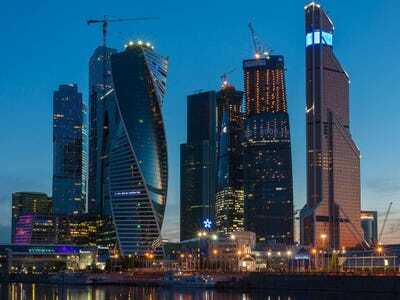 Moscow’s answer to Wall St. and London is relatively empty — and it’s presence reflects the larger problems in Russia’s economy, according to a report by the New York Times. Not to be confused with the capital itself, “Moscow City” is the skyscraper-filled financial center within Moscow itself. 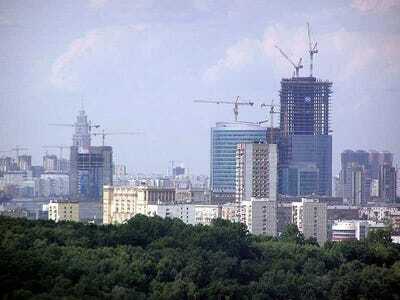 Originally called the “Moscow International Business Center,” Moscow City was envisioned as an international center for business, entertainment, and living. The center was built incredibly quickly during the 2000’s: 8 skyscrapers are complete, 8 more are under construction, and 2 more will be built in the future. The entire project is expected to be complete by 2018. However, the center has two problems: it’s emptying out, and it’s not quite a financial center. “Vacancy rates in the newly built financial district have become acute. The entire site, some 148 acres that now includes the tallest building in Europe, Mercury City Tower, had a vacancy rate of 32 per cent at the end of October, according to Cushman & Wakefield, the real estate consultancy,” the Times reports. There’s some discrepancy over the exact vacancy rate, however. The development management company for the financial sector, City, estimates that the vacancy rate is more like 20%. In any case, financial services companies aren’t the primary occupants of Moscow City anymore, according to City. WikimediaMoscow City in 2006 — just eight years ago. Although right now the center is facing troubles, several years ago the project made sense. Russia was growing at 7% per year from 2000 to 2007; the Russian Trading System opened in 1995 (now called the Moscow Exchange); and the country was waving good-bye to its Soviet past. Everyone was expecting the Russian economy is flourish into a major international power worthy of a international finance hub. But today, things are looking a little different: Russia’s political agenda has taken center stage. Following the sanctions imposed by the EU and the US, the Russian economy has taken a serious hit. The ruble is in free fall, inflation is way above target, and falling oil prices have put immense pressure on the economy. Two of Russia’s largest state financial institutions being sanctions, Sberbank and VTB, both own real estate in Moscow City. “Russia’s tanks are now getting more international attention than its banks, leaving Moscow City as $US12 billion reminder of the nation’s economic woes,” writes the New York Times.